Want to join the Archdiocese of Ottawa group attending the BIGGEST Catholic Youth Conference in Canada, July 12 - 14th? Find out more about this year’s conference! Questions or Comments? Contact Andriano De Luca, 613-738-5025 x222. enter to win a $25 Cineplex Gift Certificate! This woman is a leader in her community, leading with grace, generosity, kindness and wisdom. She is selfless and is always willing to do what is needed, often going above and beyond expectations. She is heavily involved in her parish’s youth activities, vacation bible school, youth choir, is involved in the Challenge movement and CCO, in addition to having led the Alpha program in her high school. 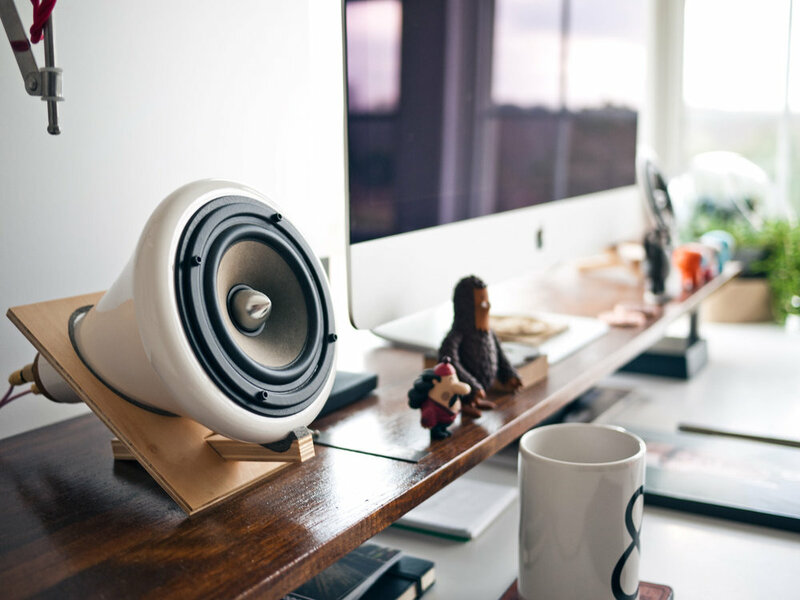 On any given night, you can find her bringing calm to a chaotic situation, listening intently to what others are sharing, using her beautiful voice to bring glory to God, or simply sweeping the floor before heading out. She has emerged as a strong leader who is courageous with sharing her faith. She uses her gifts to lead and inspire others, furthering the kingdom by sharing the Gospel through living a faith filled life. The 2019 Don Bosco, Heart of Youth Ministry Award goes to Grace Smyth of Holy Redeemer Parish. 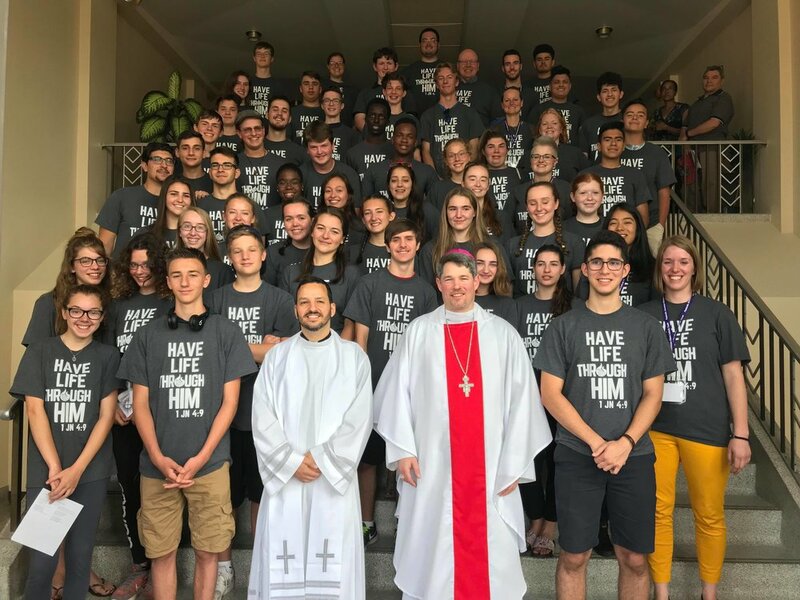 Years following her own participation in her parish’s youth group, this woman re-initiated the group and has been leading it for the last two years. An incredible example to her peers of how to welcome others, she has invited young people to Christ. She is disciplined, gracious, and organized, offering much of her time to youth ministry. 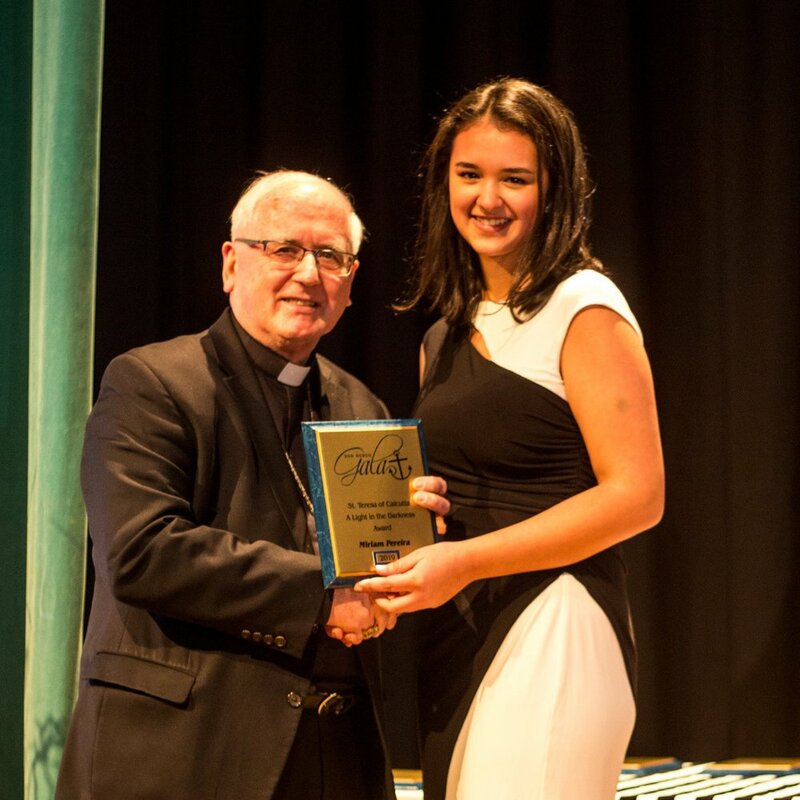 She effortlessly motivates young people to become involved in other aspects of parish life as well. Though this all she maintains a healthy balance of accountability to her studies, work, and family. Her dedication to involvement in her parish spans over 15 years, displaying her faithfulness. The St. Phoebe, Servant of the Church Award goes to Bianca Picciano of the Resurrection of the Lord Parish. This man is the silent but solid foundation behind the youth ministry at his parish. Never seeking the spotlight, he selflessly invests his time, resources, and gifts to support the faith development of young people. Influenced by his example and devotion, his entire family has emerged as capable and zealous leaders. His hard work and caring attitude attract many others to participate in ministry as well. In his humility, he is a true evangelist, unfailing pointing towards Christ. The St. Joseph, Man of God Award goes to John Nung from Sheng Shen Chinese Parish. This man is a key member of his parish youth ministry, involved in both the Senior and Junior youth nights. He is always willing to mentor others, and has helped shape many talks and testimonies. He is passionate about the sacraments, and has the gifts of encouragement and service. He is an incredible role model, and is willing to serve wherever is needed. He has demonstrated commitment to youth ministry by investing in his own spiritual life and seeking out opportunities to share the Gospel. He will be serving as a 2019-2020 missionary with NET Canada. The St. Peter, Rock of the Church Award goes to Brandon Milley from Annunciation of the Lord Parish. This young woman has a compassionate heart, living out of her charisms of pastoring and encouragement. She has been a long-term volunteer of youth ministry, serving in a variety of roles. She has demonstrated great maturity in her faith and great confidence in leading others to Christ. There is a transparency to her that makes her easily approachable, especially to those who are grappling with their own faith. She has extended her leadership by assisting with a peer-led ministry and is involved in the Challenge movement. Through her kindness, she encourages others to strive higher in their faith. The St. Teresa of Calcutta, A light in the Darkness Award goes to Miriam Pereira of Divine Infant Parish. This woman saw a need to bring youth together in her parish, so that they could grow together in their faith. Through her leadership skills, she has created a vibrant youth program, in addition to serving in many other ministries in her community. She thrives on helping others, and has been a source of care and compassion for many youth for several years. She is to be commended as an organizer, confidante, and brilliant role model. The St. Marguerite Bourgeoys, Bold Initiative Award goes to Jessica David of the Immaculate Heart of Mary Parish. Faithful servant, this man has significantly grown in his faith and leadership over the last few years. He is an extremely reliable member of his parish, serving in many different ways. He thrives through service, simply giving of his time and efforts without a second though. Willing to step outside his comfort zone, this man accepts opportunities to share his faith whenever they come up. He is constantly looking for ways to become a more effective witness, to share the Gospel more deeply, and to respond to the great plan God has for him. The St. John the Apostle, Beloved of Christ Award goes to Cameron Schieman of Divine Infant Parish. Always encouraging youth to have spiritual ambition and to make their relationship with Christ authentic, this man is involved in leading the youth of his parish both formally and informally. 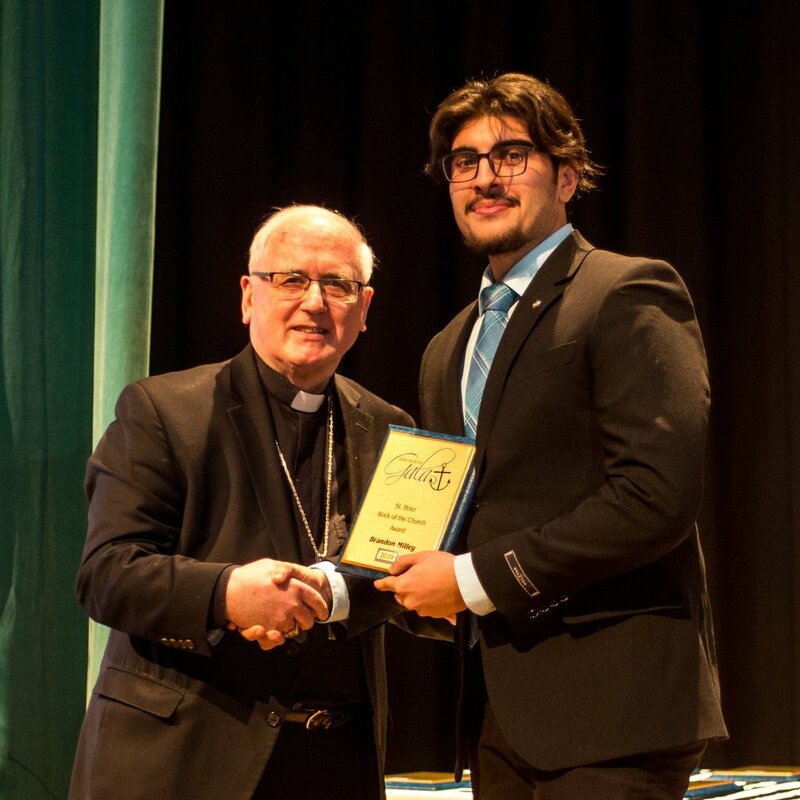 His inspirational witness of faith has facilitated a rich environment for youth to share about their life, building trust as they journey in their catechesis together. This genuine leader freely shares his own faith story and is unafraid to accompany others on their own walk - always remembering the hope of salvation. 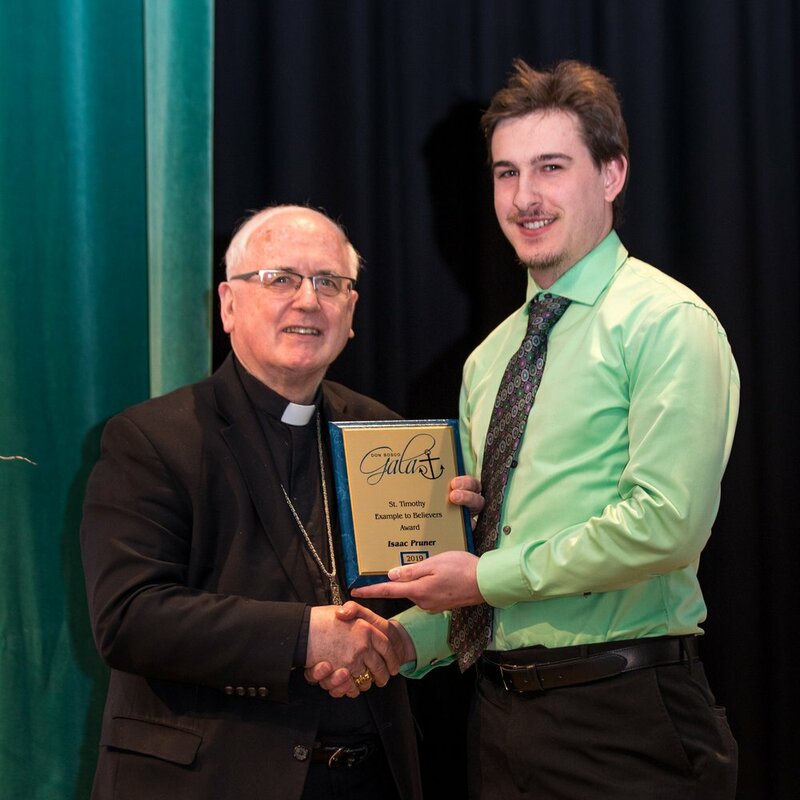 The St. John Paull II, Be Not Afraid Award goes to Landon Coleman from St. John the Baptist Ukrainian Catholic Shrine. Truly living out Jesus’ instruction on being the last and being the server of everyone else, this man’s involvement in youth ministry has spanned many years. His hardworking and generous nature is a tremendous gift to the youth he ministers to. He does not only evangelize through empathetic words, but also through his humble and gentle actions. He is a humble leader, committed server and a thoughtful brother to all. The St. Timothy, Example to Believers Award goes to Isaac Pruner from St. Mary’s Parish. This gentleman is a passionate supporter of youth in his parish. Through his countless leadership roles over many decades, he has been a tireless advocate for establishing a robust youth ministry and has actively prioritized ministering to youth in all aspects of parish life. He never fails to reach out to the young people and families of his community, and in response they often turn to him for advice and guidance. He is always willing to sacrifice for the sake of building up the kingdom of God, and has proven himself resilient in the face of obstacles. This visionary man - with the heart of a youth - has spent a lifetime demonstrating true courage and commitment in the mission Christ has set before him. The St John the Baptist, Prepare the Way of the Lord Award goes to Jean Belanger of Holy Cross Parish. This woman’s most outstanding attribute is allowing the youth of her parish to experience the global Church through her leadership on a number of World Youth Day Pilgrimages. From personally encouraging their involvement, to fundraising, to leading the logistics, she tirelessly puts in the time to offer this incredible encounter. She is hardworking and willing to serve from the start to end of an event. She presents herself remarkably well in front of others of all ages, and is a contact presence in her parish community. The St. Faustina, Model of Mercy Award goes to Ana Raquel Aparicio from Sagrada Familia Parish. This woman takes initiative, knows when to act and when to delegate, can capture the attention of a large group of people, and always ensures everyone is loved and included. Often the first to show up and last to leave, she has proven her reliability and enthusiasm. She is hardworking and shares the Gospel through loving the person in front of her and responding to the duty of the moment. Her hardwork and dedication has made a huge difference in her parish youth ministry. She is a true warrior for the church. The St. Joan of Arc, Zeal for Christ Award goes to Emily Grace Linton-Leblanc from Annunciation of the Lord Parish. Discover their favourite parts of ministry and fun facts by clicking on a name and hovering over the enlarged photo! God is doing amazing things through Youth Ministry in the Archdiocese of Ottawa, and one night a year we celebrate that in a big way! Sign up to receive our monthly newsletter and occasional special announcements! We respect your privacy and will only use your contact information for this purpose.